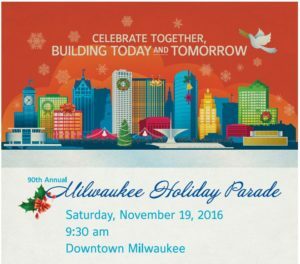 This sounds like another opportunity to have fun while making a contribution to the community — a Holiday Parade, Downtown Milwaukee, November 19th. Johnson Controls has sponsored this event for 14 years. Last year the company team collected 2,000 lbs of food for the Hunger Task Force. Look for the donation bins to get in on the fun! Word has it that next year with some advance notice WSJ Society members will be invited to help with the event. For this year, making a food donation will have a BIG impact for someone in need. Here’s a link to the Milwaukee Holiday Parade website for more information. Please do what you can … where ever you live.